Aimée Leduc is having a bad day. First, she comes home from work at her Paris detective agency to learn that her boyfriend is leaving her. She goes out for a drink with her friend Laure, a police officer, but Laure’s patrol partner, Jacques, interrupts, saying he needs to talk to Laure urgently. The two leave the bar, and when they don’t return, Aimée follows Laure’s path and finds her sprawled on a snowy rooftop, not far from Jacques, who is bleeding from a fatal gunshot wound. When the police arrive, they arrest Laure for murder. No one is interested in helping Aimée figure out the truth. 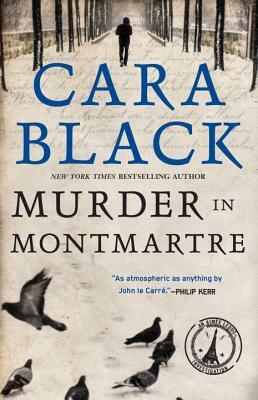 As she chases down increasingly dangerous leads in the effort to free her friend, Aimée stumbles into a web of Corsican nationalists, separatists, gangsters, and artists. Could Jacques’s murder and Laure’s arrest be part of a much bigger cover-up? "As always, the Parisian setting is vividly evoked, the heroine's wardrobe is chic, and the action is non-stop. The story has its Nancy Drew elements—secret passageways, confrontations in darkened graveyards, chases across cobblestones in spike heels . . . If you long for the adventure-filled stories that got you hooked on reading in the first place, you'll enjoy this."